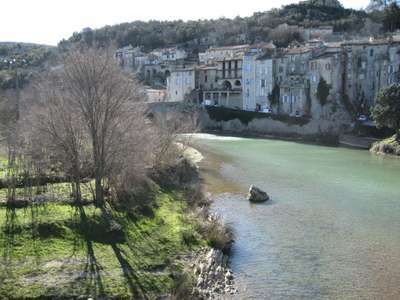 We made it to Nîmes yesterday afternoon by car, after our stopovers in Sauve and then in the beautiful village of Uzès for lunch. 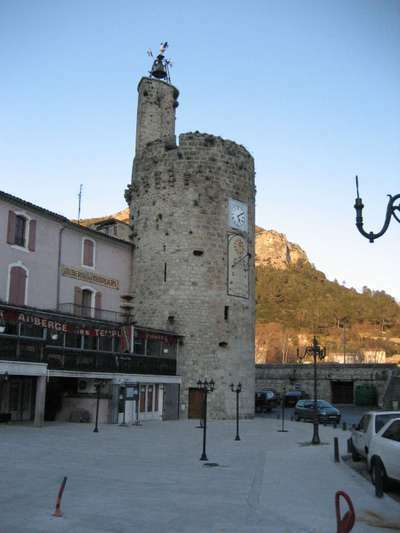 The Capital of the Département du Gard, made up of more than 130,000 inhabitants, is known for many things. First of all, Nîmes was known in history for its textiles, and specifically a long-wearing hardy fabric developed here called Serge de Nîmes, and eventually shortened to the blue jean material we are familiar with today known as denim. 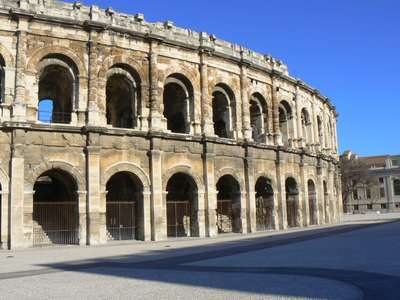 Nîmes is also known for its Spanish-style bullfights, and specifically for its two annual ferias (bullfight festivals),which take place in its well-preserved Roman Amphitheater, Les Arènes (bullring). 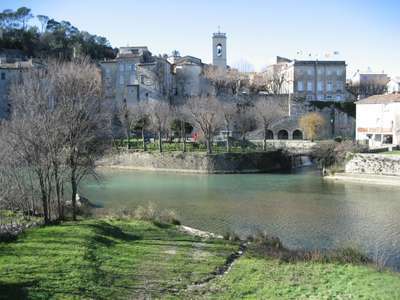 Additionally, Nîmes is known as the “Rome of France”, because of its past importance to the Romans, resulting in many important Roman monuments erected here, including the spectacular Pont du Gard aqueduct, which was built nearby to carry water from the springs of Uzès to the Spring of Nîmes. Nîmes received its name from this Spring, called Nemausus by the Romans, which has always provided the core and the lifeblood of the city. 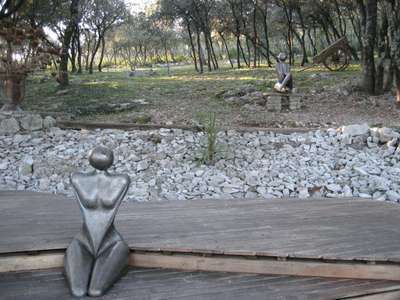 The Spring is the reason the city was originally settled, and it is how the city originally received all of its water, and it is the reason the city prospered in the textile industry for hundreds of years, even in times of drought. And now it seems as if the Spring is being honored as the focal point of the Jardins de la Fontaine (Gardens of the Source), built in the 18th century among the former ramparts and other ancient Roman ruins, encompassing the water basins and waterways that formed the original heart of the city. 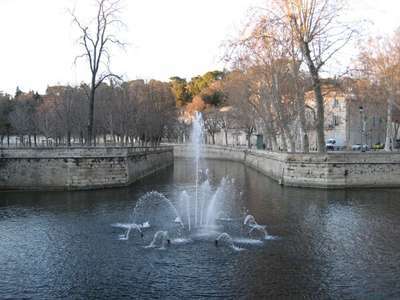 The cascading stairways provide a backdrop, leading up the hill to the Tour Magne, from the top of which provides a panoramic view of the city. For 9.80€ each we got to visit the three major Roman edifices of Nîmes: les Arènes de Nîmes, la Maison Carrée, and la Tour Magne. Les Arènes de Nîmes is used primarily for the very popular Spanish-style bullfights. On our visit to the arena today, we just happened to run into a group of about 10 young wannabe bullfighters, practicing their art in a most serious manner. 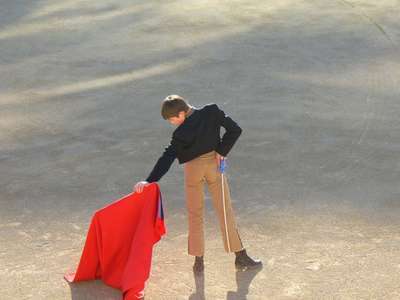 Although, there were no real bulls in the arena today, there were a couple of young men who were pretending to be bulls, each holding a set of real horns to their heads in a menacing stance, and then charging toward the toreros (bullfighters). 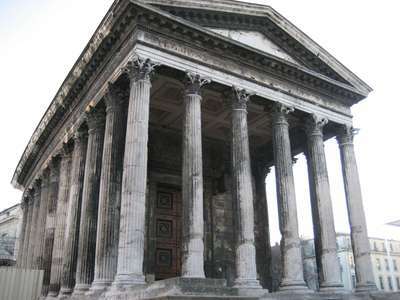 La Maison Carrée is a Roman temple built around 17 B.C. The well-preserved temple is most appreciated from the outside with its commanding Corinthian columns, and was used as a model by Thomas Jefferson for the Virginia state capitol. Once inside, you find a seat, then you don your special glasses to view a short 3-Dimensional film depicting some of the legendary figures of Nîmes from its ancient past. Unless we missed something, which is very possible, there didn’t seem to be anything of interest inside. There may have been a museum somewhere inside or outside, but we didn’t find it – or maybe it was closed this time of year. 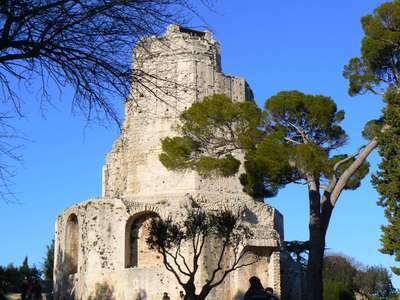 Climbing the stairs up Mont Cavalier behind the Jardins de la Fontaine, you reach the octagonal Tour Magne, where your ticket allows you to climb the 140 interior steps of the oldest Roman monument in France for a panoramic view of Nîmes. We had a very nice dinner last night at the restaurant in the Hotel Imperator Concorde, in front of the Jardins de la Fontaine, where we had tried earlier, with no success, to get a room for our stay here. 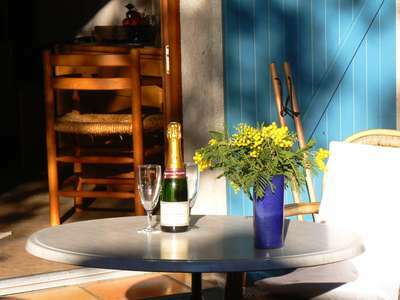 I don’t know if all the hotels were booked, or if they were closed for the season, but the only place we found with available rooms was the Hotel Kyriad (10, rue Roussy, tèl: 04.66.76.16.20), which was very inexpensive, and very conveniently located in the middle of the centre ville. It isn’t the type of place you would like to hang out in for the day, but it was satisfactory. 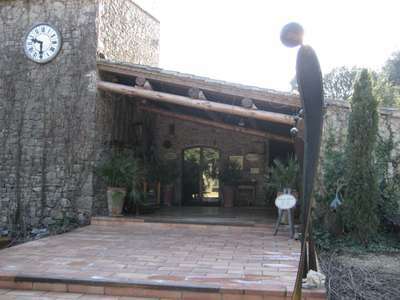 I think the next time we go, if we can’t get into the Hotel Imperator Concorde, I might try the Royal Hotel (3, bd Alphonse Daudet, tèl: 04.66.58.28.27), above a tapas bar called La Bodeguita, which might be fun to try. Tonight’s dinner at Restaurant Nicolas was memorable, only in that we will remember not to return. The proprietress was quite a character, in a good way, and the servings were large, but pas terrible (not very good). Unfortunately, there were not a lot of choices for a Sunday night this time of year. At last night’s Winemaker’s Dinner at Le Ranquet, we met a couple who lived in the village of Sauve in the Département du Gard. They informed us that it was a village that was very bizarre and very interesting, and it would be on our way as we headed to Nîmes today. So, of course, we had to check it out. Just as we arrived into the lively main square of the beautiful medieval village, strolling past the colorful market vendors, we ran into one half of the couple we met last night, Joachim, who recognized us before we recognized him. He was very friendly, and introduced us to another friend of his, Jeremy, who happened to walk by while he was talking to us. They were excited about a newspaper article that had just appeared in Le Figaro, which recounts the simmering battle currently taking place here in Sauve, a normally serene and picturesque hamlet of less than 2000 inhabitants. The bone of contention has split the village into two, with one faction siding with the local villager fighting to sell his warehouse to a discount supermarket chain called Ed, while the other faction is siding with an American outsider fighting to maintain the character and the lifestyle that attracted him to this medieval village which he has made his home for the last 15 years. An interesting note, and the most likely reason that this story has drawn national attention, is that the American fighting to preserve his way of life in Sauve is none other than the renowned American cartoonist, Robert Crumb, of Fritz the Cat and Keep on Truckin’ fame back in the late 1960s & ‘70s. We were familiar with him, for the most part, because we had seen the documentary, “Crumb” (by Terry Zwigoff, 1994), which chronicled a portion of his life while he lived in San Francisco. 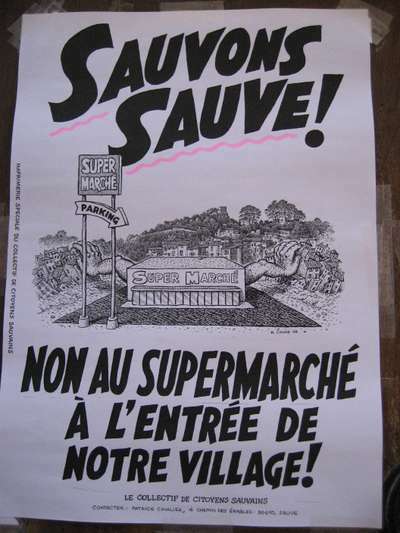 After stopping for a cup of coffee in the lively main square, where everyone seemed to know each other, we picked up some local specialties from the Saturday marché, and then strolled along the small walkways and alleys of Sauve, coming across many of these “Sauvons Sauve !” (Let’s Save Sauve !) posters affixed to walls and doors all around the village, drawn in the incontrovertible “R. Crumb” style. I thought much later that maybe I should have taken one of the posters – you never know, it might be a collector’s item someday. By the way, we never understood the comment about Sauve being bizarre. We only saw that it was very beautiful and very interesting. Maybe it takes more time to discover the bizarre. And, if you are interested, you can read the article yourself in French in Le Figaro here, or in English in Britain’s Telegraph here.